DeFrantis hurried down the hallway toward the child’s voice, shaking the sleep from her head. The lantern she held wobbled back and forth, making shifting shadows before her. She reached out to steady herself on the wooden wall, and half-wondered why the corridor’s floor wasn’t undulating or stretching. She paused for a moment, squeezed her eyes shut, then looked again, seeing more clearly. OK. The dream’s done, isn’t it? This is real, right? Marisee is still crying. DeFrantis lurched ahead, her walk getting more stable as she awakened. She must’ve had another nightmare, too. When will this be over? It didn’t take DeFrantis long to reach the hallway of the orphanage wing. The first two doors were the dormitories. Boys on the left, girls on the right. She hurried to the right. The room was long and high, with about a half dozen small beds all along one side. Each was little more than a billowy blanket stuffed with straw spread on the floor, with pillows and blankets above. Wrapped into each one was a young girl. In one, halfway into the room, Marisee was sitting up, crying out. As soon as she saw DeFrantis’ face in the lanternlight, she stopped sobbing and began simply sniffling, wiping her face with her baggy white sleeve. “It was h--horrible! It was a h--huge dragon, like that m--man said! It was going to eat--eat me up in one bite!” her voice trailed off into crying again. DeFrantis held her close and stroked her hair. “It’s OK. You’re safe now. You’re safe.” Memories passed through her thoughts. Back in Twynne Rivers, there were many nights of frightening dreams. Childhood is full of them. She used to calm the children, and promise that she would always protect them. I can’t say that any more. I can’t always keep that promise. Tears swelled up in her own eyes. I can only promise to fight for you. For the moment, all she could say was a sweet shushing sound as she hugged and rocked the girl back and forth. In between sobs, Marisee begged, “Can you make it dark?” This simple plea took DeFrantis back to those long nights of fear and sleeplessness in the city. They were usually when the storms would rage around whatever flimsy shelter they had found. Once they had settled into the old chapel, those nights had become less frequent. Maybe it was because it was strong and stable, or maybe because it was a chapel, but it was much easier for the children to sleep there. Still, there was one thing DeFrantis could do when the fright would not go away. DeFrantis raised her head, closed her eyes, and focused her will. Slowly, the shadows along the wall, under the beds, and down the hall began to swirl and flow toward her. They gathered around the bed, coalescing on the child in her arms. She was quickly engulfed in shadow and darkness, a darkness DeFrantis knew well. She felt the shadow begin to absorb all of the fear, tension, and uncertainty from her, draining them all away. Marisee also relaxed in her arms and stopped crying as the cooling dark swept away her fears. Within moments, DeFrantis felt the child’s breathing slow to an easy rate, and she knew Marisee was sleeping again. DeFrantis released the shadow, letting it subside, and the room was dim once more, dark, but lit from the lantern at the bedside. She eased the girl back into the bed, drew up the blankets, and gently stroked her hair from her eyes. Smiling, DeFrantis stood, and picked up the lantern. She walked through the room once, quickly checked on the others, who slept soundly. Then, she returned to the hallway, lingering for only one last checkover at the doorway. Inclusion at the table is a big deal these days, and rightly so! My son, and one of the dev team for The Hero's Tale RPG, Jacob, has Cerebral Palsy. It basically means that his brain doesn't talk to his muscles very well. That effects those that have the condition in many different ways. Some have tense muscle tone, others are very lax. Some are cognitive and verbal, others are not. Some can learn to walk and function, others can't, and many are in-between. Jacob has very high, tense muscle tone. It's virtually impossible for him to use his legs, and he's stuck in a wheelchair full time. He struggles to use his arms and fingers with any real control. He is, however, fully cognitive and verbal. So, he has been playing RPGs with us ever since we first created The Hero's Tale, even before we called it "The Hero's Tale". And rolling dice has always been a struggle for him. Here's why. 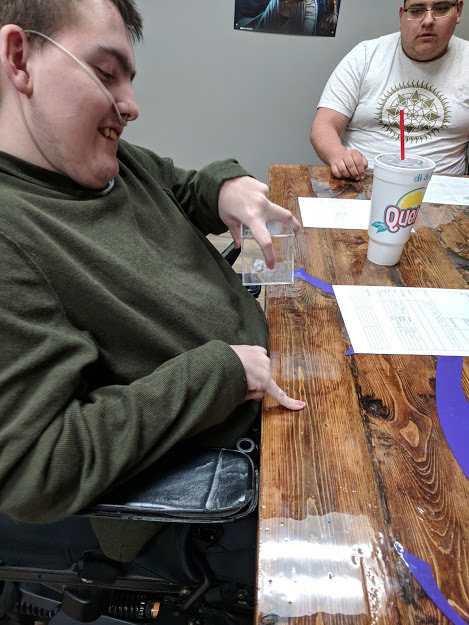 Picking up one of the small d20s means he has to isolate his thumb and forefinger, reach out (a difficult move with high muscle tone), direct his fingers to open and pick up the die, raise it, and then drop it and hope it doesn't roll away, or fall down under his wheelchair. 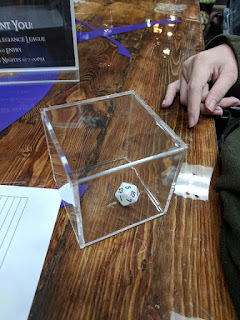 We've experimented with larger dice, and those are much easier for him to wrap his palm around and pick up, but the large d20s have numbers aligned and arranged for MTG scorekeeping (called "countdown" or "spindown") rather than a random arrangement. It works, but it's not as random. Now, we have found the solution! We put a small d20 in a larger plastic box. This one is a display box for an autographed baseball. He can pick up the box easily, shake it, and set it down to see what number he rolled. Easy grip, easy roll, and it doesn't fall on the floor! A bonus benefit for everyone: How many times has an over-eager player tossed a die and had it roll off the table, or, worse, tumble onto the battlefield, scattering walls and miniatures as it goes? There's no save vs the die itself! But if everyone at the table uses this method, there are no scattered dice, no hunting under the chairs! Just shake the box and read the die! Her head throbbed, and her arms ached. With an unsteady stumble, she made her way down the corridor. It was dark and empty, and not the kind of welcoming darkness that she always found underneath her blankets as she slept, but a cold and haunting darkness that made it hard to see more than a few steps in front of her. She leaned against the wall, steadying herself. There was a light. She tried to focus her eyes before her to see what it was. It came into clarity gradually. It was a door, with bright lights shining out from underneath, and through the cracks in the doorway. There. I’ll go there! It’s not far. Then I’ll lie down and rest. DeFrantis looked at the floor before the door. She leaned forward, and took a step, still touching the wall for support. She stepped again. As she walked, she saw that the door didn’t seem to be getting any closer. Confused, she walked faster, trying to maintain her balance. She stopped. What’s wrong with the floor? It was fluid and flexible, not firm like it had been moments before. It rippled and stretched below her. She felt the hair on her arms and neck get tense as cold blew down the corridor. What’s happening? What’s going on? DeFrantis broke into a run, trying to reach the door. She only took a few steps before she fell. Her knees and hands took the brunt of the impact, and it hurt. She tried to stand, but her hands were slippery. Her head drooped, as she gasped for breath. Wait, what’s this in my hands? She looked. Her hands were coated in blood, and one of them held a small, thin, silver dagger. Blood soaked the floor before her, and it was spattered all over her sleeping gown. She screamed and dropped the dagger. But it didn’t drop. She still held it in her shaking hands, unable to open her fingers. She heard a distant cry. A child’s voice. A little girl. Where is she? Where is that cry coming from? She scrambled to her feet and lunged for the door, flinging it open. The blinding light hurt her head, and she shielded her eyes. A man stood silhouetted in the doorway, towering over her. She screamed again and stumbled back. He raised his hand and pointed at her. “It was you!” He leaned forward, but rather than stepping, he fell. DeFrantis jumped back, slipped and landed on the floor as he crumbled, chest down, before her. DeFrantis shook her head, but she couldn’t speak. She looked at her bloody hands, and the bloody dagger. She opened her mouth to explain, but said nothing. She couldn’t deny it. “What do YOU know of children!” The woman shouted. She grew taller, stretching unnaturally, her hands reaching out toward DeFrantis. “YOU KILLED MY CHILD!” Her arms and body twisted and snaked toward DeFrantis like thick leather whips, snapping tight. Her hands grabbed DeFrantis’ face and pulled her forward, drawing her nearer. The woman’s distorted face screamed again, “YOU KILLED MY CHILD!” Her fanged mouth opened wide to bite into DeFrantis and tear her apart. DeFrantis’ body shook with jolts of fear and pain. She twisted, trying to free herself from the grip of madwoman’s hands. She tossed her shoulders, and turned her hips, finally shaking her blanket free. She opened her eyes, gasping for breath, cool summer air from the dark, but open window flowing lightly across her sweaty shoulders and nightgown. Gentle moonlight also streamed in through the window, falling across her legs, and reflecting dimly onto the familiar walls and ceiling of her small chamber. 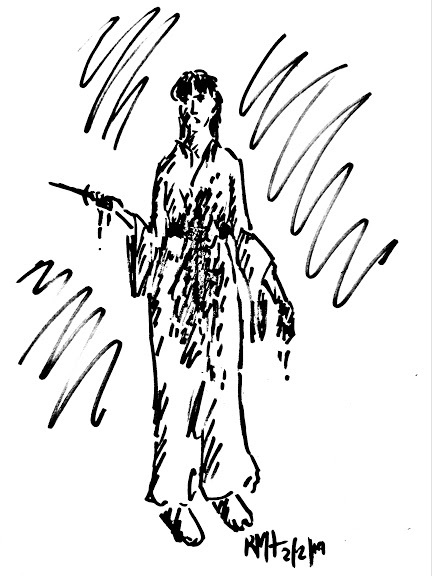 She frantically grabbed the folds of her nightgown and held them up to her gaze. The cloth was white. Her hands were clean. There was no dagger. No screaming mother. She wiped her hand across her forehead, then over her head, pulling her hair away from her face. Her breathing slowed, eased, and she rested her limbs into her thin and bumpy mattress. She passed her hand over it, then gripped it, tentatively, feeling its reality. She looked to her left, along the chamber’s wall, and saw other mattresses and blankets, and the peacefully sleeping forms of Karendle and Thissraelle. She could hear Karendle snorting soflty. From down the hallway, DeFrantis noticed a child was crying. “I found out that this part of the city is called the ‘Outer Wall’, I guess because it’s outside the wall.” Parith spoke as he deftly stepped through the night air, along the ridgeline of a rooftop. He walked with a lightness, as his feet and balance were secure. Behind him, Korr followed, but not as quickly, and with much less confidence. “I told you, I grew up in Umbrawood Forest,” Parith explained, “So this is a lot like walking through the branches in the trees.” He came to the end of the roof, and stopped for a moment. Korr caught up to him, and Parith continued, “That, And it’s always dark in the forest. That’s why it’s called Umbrawood.” The building next to him was close, and just a bit higher, so it was easy for him to step up and over, onto it. It was a hot night, not long after the midsummer celebrations had passed. While it was dark, the three-quarter moon provided some illumination. The roof of the pub they were on was a bit taller than the other shops and buildings around them, affording them a view over the sprawling city. They could see rooftops and smoking chimneys dotted by lanterns shining through windows onto the streets and alleys. In this section of the Outer Wall, near the main road out of Twynne Rivers, the buildings were stronger, and very close together. Within a few streets, the firm rooftops gave way to thatching and other, less permanent, shelters. Occasionally, the cityscape was interrupted by a taller structure, like a two-story inn, or a chapel bell tower. “Over there is the wall.” Parith pointed the other way. Korr looked and saw the dark and forbidding barrier spanning his field of vision. It was taller than most of the buildings around them, but Korr could see spires and points beyond its parapets. The wall itself was interrupted from time to time by a guard tower, illuminated at the top and from the windows with the steadily glowing oculus gems. Few living in the Outer Wall could afford that kind of lamp. “On the other side is the Inner Wall. It’s a much nicer part of the city. I’ve been able to sneak in a few times. But we’re going this way!” Parith said, jumping the short distance to another rooftop, and crawling up to the crest. He stood, and gestured to Korr to follow. The next rooftop was closer and didn’t require quite the jump. “Why are you in the city?” Parith asked. “Who is Heathraxx?” They stopped. They had come to edge of the current rooftop, and were right up against the chapel. Parith looked up at the steeple. To get to the open bell area, they would have to jump up and catch the roof edge, crawl up the slope, then climb the last way into the tower. Parith looked at his companion. Oh, my flames! Have you ever seen anyone fight like that? Parith Laren looked down on the surprised people in Inn’s common area from the darkened space in the rafters and cross beams above. He watched the tall, oddly-dressed human talking to the ones that he had been fighting just moments before. He had been sitting at a table in the corner just before the fight broke out. His short time in Twynne Rivers had shown him that it was pretty diverse, especially in the merchant and riverfront quarters, but still, there weren’t so many elves. In addition, this part of the city wasn’t the wealthiest or the most patrolled, either. So, when the shouting started, his first thought was to get out of the way. That, and when all of the humans stood up to gawk at the fight, he had to find a better vantage point. Next to the table where he had been sitting was a large, square, wooden pillar, supporting the beams and rafters where the ceiling and roof are attached. He had leapt onto the table, the up at the pillar. He pushed off the pillar and launched himself up onto one of the beams. From there, it had been easy to jump from one to the other to get to a place where he could see clearly. It reminded him of jumping from branch to branch in the forest canopy of his home in Umbrawood. Fortunately, everyone was too transfixed by the drama unfolding below to pay any attention to a quick elf in the smoky darkness above. Parith saw the peasant man toss the stolen pouch to its original owner, then slip between people in the crowd as everyone watched to see what the tall man would do. Surprisingly, all he did was help the other man up, the man he had just thrown to the ground like yesterday’s garbage, and give him a quick bow of the head. Then, everyone gave him a wide passage as he stepped over to his table and sat down. The drama was over, but no one was quite sure what to do. Gradually, they all returned to their seats, and the murmur of conversation returned, though what they were talking about was definitely not the same as before. As the innkeepers also began serving the tables again, Parith looked over the scene from his unique perspective. Now, how am I going to get down from here without drawing any attention? Parith glanced over at the table where he had been sitting before. Aw, flameit! My pouch and pole are there, unguarded! He began leaping through the rafters. On his second jump, he misjudged his footing on the landing, slipping and losing his balance. 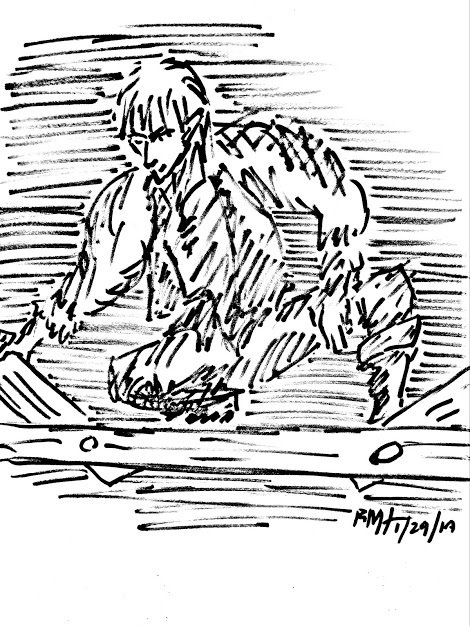 He swung his arms to steady himself, and slammed his knee into a heavy wooden rafter. The pain shot through his leg, and he clenched his teeth to not cry out. His swinging arms grabbed another rafter and held on. He steadied himself, wincing as the pain subsided into a dull throb. Good thing I didn’t fall. That would be all I’d need, to have everyone attacking the sneaky wood elf in the ceiling. 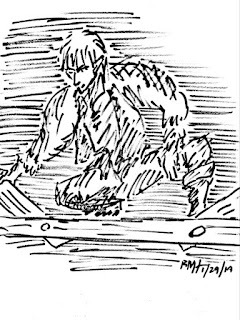 Steadied, he made the last few jumps to be above his table, then, after assuring himself that the general attention of the inn patrons was elsewhere, quickly slid down the pillar and sat down. He picked up his drink and took a sip as he glanced around to make sure nobody had been watching. His gaze settled on the stranger who had won the fight. I think I need to meet that guy! He emptied his tankard in a long drink, then stood and walked around his table toward the man. Korr was a tall man, a human, and a bit lanky. His shoulders were narrow, and unmuscular. His thin face was topped with long, dark brown hair that was pulled tightly back and tied behind his head. His dress was not like the others in the inn, having the look of a man who didn’t need much. His shirt, almost a jacket, was simple, tan, and loose, hanging down past his hips. The sleeves were a bit wide and open, and ended just below the elbow in darker brown trim. His leggings were also very loose, but didn’t reach even his ankles. His feet were clad in a simple woven leather sandal. He stood, hands together, bowing respectfully to the people staring at him. They had never seen anyone fight like he did. It’s true there were good swordsmen in the realm, particularly among the Holy Guard. But to watch someone take on three assailants, including one with a blade, using only his bare hands and feet had been a sight to see. When a motion caught Korr’s glance, he looked over toward the thin man who had been attacked first. Korr saw him moving away, between the tables. “Stop!” Korr commanded, and the man froze, tense. The man on the floor, that Korr had defeated, moaned and lifted himself up on his arms. He shook his head, and began to get up on one knee. “I stepped in because no one should be killed for the value of a purse with a few coins.” Korr explained, “But no one should steal someone else’s purse, either.” The man on the floor looked at the two of them, not sure what was happening. The silence was as heavy as the smoke in the air. Eyes darted from Korr, to the thief, to the man on the floor, and back again. Finally, the thief’s shoulders sank, and he reached under his belt and up into his shirt. He pulled out the small leather pouch and, with resignation, tossed it to the man he had stolen it from. It clinked as it hit the kneeling man’s chest, who reacted just in time to catch it. He still wasn’t sure he understood what he was seeing or hearing. By the time Korr glanced back at the thief, he was gone. He stepped over to the man on the floor, and offered him a hand, pulling him up. Again, Korr bowed slightly, and returned to his seat. “I don’t take anything,” The smaller man fearfully protested, trying to keep his balance. His clothes were also worn, but a bit worse off than his assailant. He looked weaker and thinner, like he hadn’t had the recent good fortune to eat as much as the others there had. The people in the common room went quiet and stared. Several moved away from the two, giving them room. Would they all see a good entertaining fight? It looked a little mismatched, but even an unfair matchup can be fun to watch sometimes. The inn was busy that night. In the slums of Twynne Rivers’ Outer Wall quarter there isn’t much money, but there isn’t much to do on a hot summer night, either. “Oh, no. It’s not fine at all!” the angry man shouted. They circled around the common area of the inn, and at one point passed close to Korr’s table. As they did, the original occuser lunged toward the thin, frail man and pushed him hard. He fell backward onto the table, making Korr slide his chair away. The angry man pressed forward toward the thin man on the table, pulling back to attack. There was a flash of light reflecting off of metal in his hands. Korr saw the dagger and instinctively leapt to his feet. As the attacker stabbed forward, Korr twisted and reached in, blocking the thrust and spinning the man to face him. Korr’s right hand shot under his own blocking arm. The heel of his palm hit the man square in his chest, knocking him backward, staggering from the impact and gasping for breath. Korr moved to step forward. Wait. Stop. Don’t jump in so fast. Remember. Set your stance. He stood tall, then with force, set his feet on the floor. In the square. Low center. Remember the forms. His feet resounded on the wooden floor as he planted himself firm in the new position. His thin arms moved squarely across his chest, and settled into fists at his side. Assess. Be aware. He saw the look of surprise become rage on the attacker’s face, and the two who were backing him up turned to face Korr. With a shout, the attacker lunged at Korr, thrusting the blade at his gut. Korr swept his own right fist low, up, and around the incoming blade hand, turning it aside. He stepped into the thrust and grabbed the attackers wrist. Korr’s left hand landed a solid hit down across his back, throwing him off balance over Korr’s leg and dropping him hard on the floor. With a quick twist, Korr forced the man’s hand open, and his dagger fell with a clang. Korr stepped away. Good, good. Now reset the stance! Be at peace! Find control! He began shifting his feet into the square, but before he could prepare his hand forms, an impact sent waves of pain through his back and ribs. His head and back arched with the hit, but his feet held firm. I let my guard down! 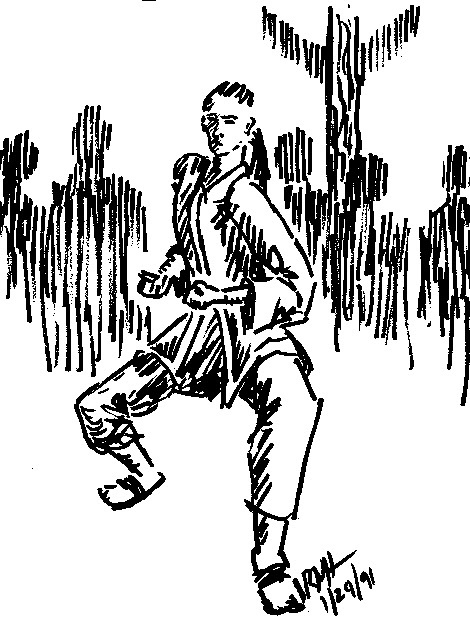 Korr spun on his backward foot, leaning into his swinging elbow, and brought it sharply into the side of the man’s head. The impact jolted him back, arms wide. Korr quickly set his feet, and let fly two rapid fist jabs to the man’s chest, dropping him backward onto some chairs. Korr recentered himself and turned to survey the room. The onlookers were staring at him, keeping their distance. He faced the remaining assailant, planted his feet, and slowly settled his body low, with his fists to his side in readiness. The man lifted his palms and slowly backed into the crowd. Korr shifted his feet to look around the full circle of the crowd, and, assured that no one else was leaping into the fight, relaxed his stance. He shook out the twists in his shirt, and nodded a quick bow to the crowd. He saw a motion from the corner of his eye. Granthurg leaned forward on his knees, leaning over the gem set into the stern of the barge. Rinkmorr used to make this work. For him, it was so easy. I always wanted to know how, but he never wanted to tell me. He remembered Thissraelle explaining how magic worked, and how the Oculi Creator, the “Eyes of the Creator”, helped. She had been teaching Karendle, and not getting very far. Granthurg had seen them, and listened in. “Anything?” Karendle was more than a bit incredulous. “Yeah, there are six different powers. Usually, a mage will study one, or at most, two. I can do a bit in three of them right now. The power of light is my personal favorite.” As she spoke, she’d held out her hand and a brightly glowing ball of light formed in her upturned palm. Karendle averted her eyes from the brightness, but wanted to stare into it. “I mostly use it to heal and to bless, but it can be used in a fight, too. It’s what Antonerri used to light up his sword as we were battling in the manor house last month.” She had flicked her wrist and the light was gone. Granthurg had asked about the other powers, and she had explained them all. She said that she had used her mental powers when they had fought the slavers outside the market. 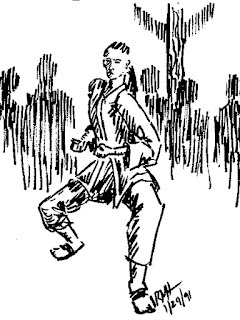 That’s how she had levitated herself into the fight, and the powers of her mind had thrown them down. That was also, she had explained, how she had found DeFrantis and Karendle, when they had been captured and reached out to her. Then, she had used her dimensional power to open a portal so they could step into the fight and join in. She had also explained that Eddiwarth had used striking power to start the fire in the manor, and that was also how the evil slaver mage had attacked Antonerri so fiercely. DeFrantis, she had said, knew how to use shadow power, and had used the darkness’ influence over life and death to heal Karendle when she was dying on the floor of the slave market. Now he knelt over the hatch in the platform, looking down at the stone. He took a deep breath, sighed and held his hand out over it. Thissraelle had said that it sometimes helps your concentration. Nothing was happening. He opened his eyes and looked down past the oculus into the water below. The water flowed with the normal run of the river under the docks. He repositioned himself, closed his eyes again, and focused, seeing his own will. Thissraelle had said to find that first, then to flow it through the stone. He suddenly felt a sharp warmth inside him, as an awakening, or a brightness. That’s it! That must be it! He directed that out of his chest, through his arm, and down at the stone. He could feel it course through him. Opening his eyes, he could see nothing. His arm was tingling with the warmth, but it looked the same. Then he heard the churning of the water below the barge, and felt the barge move underneath him. It jerked toward the stern, then yanked the tether lines taught jarring Granthurg off his knees and almost toppling him into the water. He laughed out loud! By the Creator, it worked! It worked! He leaned over the stern of the barge and could see the water splashing as the magic moved it, and tried to move the barge. A nervous thought crossed his mind. Now how do I stop it?